DEFINITIONS: Under the current rules, the franchise tag guarantees them one-year salaries equal to the average of the top five at their position and prevents other teams from signing them without a trade. There are two kinds of tags: an exclusive tag, which guarantees more money on the one-year tender and prohibits a player from negotiating or signing with another team, and a non-exclusive tag, which offers a guaranteed one-year tender but also guarantees a team two first-round picks if the tagged player signs a long-term contract with another team. The transition tag guarantees a player a one-year salary equal to the average of the top 10 at his position, and gives his team the right to match if he signs a free-agent contract elsewhere. 10 – QB Peyton Manning, Colts (exclusive franchise tag) – The Colts let Manning’s contract expire, but there’s no way that they can risk losing him. So they placed the exclusive franchise tag on him, preventing any other team from even negotiating with him. Because Manning’s 2010 contract was expensive, the rules require the Colts to guarantee Manning $21 million for 2011. But that’s a small price to play for a player who has taken a team with average talent overall to the playoffs year after year. Manning may be approaching the end of his prime, but he’s still brutally efficient on the field and a strong character who gets the best out of his offensive teammates off the field. The Colts are prepared to pay him whatever the new CBA will allow, and the two sides will undoubtedly get a megadeal done soon after the new labor deal is in place. No player in the NFL is more important to his team, so Manning is the no-brainer choice to put atop this comparison. 8 – DE Haloti Ngata, Ravens (non-exclusive franchise tag) – Few defensive linemen are as devastatingly effective as Ngata, who has a nose tackle’s size and a pass rusher’s agility. That makes him the best play-making 3-4 defensive end in football. Ngata makes plays against the run but also can get into the backfield, as he showed with a career-best 5.5 sacks in 2010. Ngata has made Pro Bowls the last two years and finally received his just due with a first-team All-Pro berth this season. He’s the best player on a star-studded Ravens defense, and now is the time for the former first-round pick to get the big-dollar contract that a devastating force in his prime merits. No wonder the Ravens are so eager to keep him and pay him. 8 (con’t) – QB Michael Vick, Eagles (exclusive franchise tag) – It’s no surprise that the Eagles tagged Vick, because they didn’t want to risk losing him after the gamble they made signing him off the scrap heap paid off handsomely. Vick emerged as not just the Eagles’ starter but as a dynamic force this season, throwing for 21 touchdowns with just six interceptions, and running for nine TDs. Despite missing four games, Vick was an elite player, earning Comeback Player of the Year honors and contending for MVP during the season. 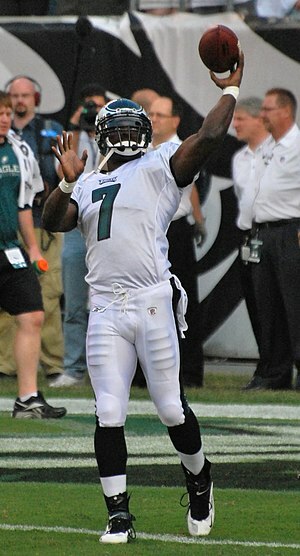 Vick has grown as a passer, surpassing his career-best in completion percentage in 2010 (62.6 percent) by a long shot. He’s in his prime, and the Eagles appear prepared to give him the kind of megadeal that franchise QBs tend to get. The Eagles will need to keep Kevin Kolb or develop Mike Kafka as a backup, because Vick gets hit more than most QBs and will miss some time, but that shouldn’t be an obstacle to keeping Vick. 6 – OLB Tamba Hali, Chiefs (non-exclusive franchise tag) – Hali, a five-year veteran, has emerged into a top-flight 3-4 pass rusher, and his emergence over the past two years has allowed the Chiefs defense to grow in stature around the league. Hali, a former first-round pick, had a career high 14.5 sacks (beating his previous season high by six) and made his first Pro Bowl. He then added a monster performance in the playoffs with seven tackles, two sacks, a pass defensed, and a forced fumble. The Chiefs don’ t have a ton of elite players, so keeping Hali as he enters his prime at age 27 is imperative. Eventually, the team wants to work out a multi-year deal, and Hali isn’t opposed if the dollars are right. So this tag seems to be a short-term means to a long-term end. 6 (con’t) – WR Vincent Jackson, Chargers (non-exclusive franchise tag) – Jackson had an acrimonious holdout last year that lasted longer than any other in the league, in part because the Chargers cut his restricted free-agent tender down to the lowest amount. Eventually, Jackson reported and played in five games, catching 14 passes. But while 2010 was a lost season, Jackson has shown himself to be a legitimate No. 1 receiver with the size to be a possession receiver and the speed to get deep. While the Chargers have other receivers with size, none is as explosive or dependable as Jackson. San Diego simply can’t afford to lose Jackson, hence the tag. But the real question is whether GM A.J. Smith’s hardline tactics have burned too many bridges between the team and Jackson. If they have, then another prolonged holdout could be in the offing. 5 -ILB David Harris, Jets (non-exclusive franchise tag) – Harris hasn’t gotten a lot of publicity in his career – he has yet to make a Pro Bowl, for example – but he has emerged as an elite 3-4 inside linebacker. He’s sturdy against the run and dangerous against the pass, and he’s able to blitz at times as well. He is the heart of the Jets’ defense, and so the team franchised him instead of WRs Santonio Holmes or Braylon Edwards, among others. It’s a good move, because Harris can become the Ray Lewis of their defense, providing stability and impact inside while allowing the players around him to make the splashier plays on the blitz in the Jets’ uberaggressive scheme. Harris has already signed his tender offer. 5 (con’t) – OLB Lamarr Woodley, Steelers (non-exclusive franchise tag) – Woodley has been a double-digit sack man for the last three years, and more impressively he has a sack in all seven of his postseason games (11 postseason sacks total). He’s the best pass rusher the Steelers have, and while he may not be quite as versatile as fellow OLB James Harrison, he’s definitely a key cog in the Steelers’ defense. And after four pro seasons, it’s fair to expect Woodley to be in his prime over the next few years. He’s in line for a high-dollar deal, and the Steelers don’t seem averse to paying him – although negotiations have dragged to this point. So the Steelers, who tend not to use the franchise tag, have taken the step to make sure this burgeoning player doesn’t join the list of those who got away. Wood;ley has already signed his tender offer. 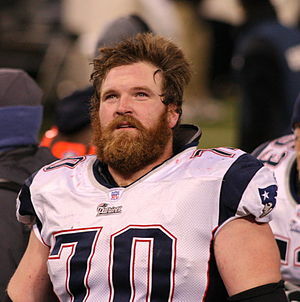 4 – OG Logan Mankins, Patriots (non-exclusive franchise tag) – Mankins sat out the first half of the season rather than play on a restricted free-agent tender, yet he still made the Pro Bowl. He’s become an all-star regular based on his physical play inside. Mankins, a former first-round pick, expressed his desire for a trade last year, but he may be more apt to accept a $10-million-plus one-year deal for 2011 than he was to risk his health for a $1.5 million deal in 2010. It’s hard to imagine that any guard would be worth this kind of money, but the Patriots clearly don’t want to lose Mankins, and they’re willing to pay for him to play. The question is whether Mankins will let bygones be bygones and move forward from this point. 3- OLB Chad Greenway, Vikings (non-exclusive franchise tag) – The Vikings faced a major choice with their franchise tag between promising WR Sidney Rice, pass-rushing defensive end Ray Edwards, and Greenway, and they opted to use their tag on Greenway. The former first-round pick has yet to make a Pro Bowl, but he has led the Vikings in tackles the last three years, and after missing his rookie season he’s played in every game over the past four years. Even better, Greenway wants to stay with the Vikings, and he sees the tag as an honor, not an obstacle on the market. The question is whether paying $10 million to keep a versatile linebacker and team leader is worth it to the Vikings, when it likely means losing Edwards and may mean losing Rice as well. Much like the Jets, who tagged David Harris for the same reasons, the Vikings made a choice for continuity and cutlural reasons. But Greenway falls a tad bit below Harris in terms of performance, and that makes Minnesota’s use of the tag a little more of a stretch. 3 (con’t) – C Ryan Kalil, Panthers (non-exclusive franchise tag) – Kalil, a two-time Pro Bowl alternate center, has played well for the Panthers since becoming a starter three years ago. He’s a highly effective pivot for an offensive line that needs to be solid for the Panthers’ offense to be effective. That’s why the Panthers opted to ensure they will keep Kalil instead of tagging RB DeAngelo Williams or emerging DE Charles Johnson. It’s a good move in that Kalil is eager to stay, even on a one-year deal, and also in that he has been more consistent that Johnson and younger than Williams. But the fact that Carolina must risk two of its top three free agents to the open market shows how the team’s philosophy to build through the draft has fallen apart. If a team is going to build through the draft, it must keep its own guys, and the Panthers can’t afford to lose Johnson or Williams after watching Julius Peppers walk away last year. So tagging Kalil is fine, but no move the Panthers made could overcome the dangerous situation the team’s overall philosophy the last few years has put the franchise in. Kalil has signed his tender offer. 3 (con’t) – TE Marcedes Lewis, Jaguars (non-exclusive franchise tag) – Lewis finally fulfilled his potential as a former first-round pick in 2010, making his first Pro Bowl as he emerged as a major receiving threat. He set career highs with 58 catches (up from 41), 700 yards (up from 518), and 10 touchdowns (up from 2). In many ways, Lewis became the Jaguars’ most dangerous threat, better than outside receivers Mike Thomas and Mike Sims-Walker. So Jacksonville can’t afford to lose Lewis, hence the tag. If Lewis can build on his breakout season in 2011, his long-term contract will be even more lucrative. 3 (con’t) – OLB Kamerion Wimbley, Raiders (non-exclusive franchise tag) – The Raiders thought they would be able to keep Wimbley via a buy-back clause in his contract that would cost them $3.5 million, but the convoluted CBA rules invalidated that option. That was a boon for Wimbley, who instead scores a one-year deal worth more than $10 million. Wimbley, a former Browns first-round choice, saw his career revitalized by the move to Oakland this year, as he put up nine sacks, the most since his rookie season in 2006. Wimbley brings an outside pass rush for the Raiders that no one else on the roster can, which proves to be a nice complement to a solid defensive line featuring Richard Seymour and promising rookie Lamarr Houston. And since the Raiders locked up Seymour earlier this month and CB Stanford Routt just before the franchise tag deadline (both at franchise-player prices, by the way), the tag was free for Wimbley. Routt was actually a key guy for the Raiders to keep, since Nnamdi Asomugha will almost certainly be leaving via free agency. Routt rebounded in 2010 (much like Wimbley did) and played at a high level. Wimbley is happy to sign his 2011 tender, given what his contract status is. The Raiders stabilize their defense, although it comes at the cost of $10 million and the risk of losing TE Zach Miller via free agency. 3 (con’t) – NT Paul Soliai, Dolphins (non-exclusive franchise tag) – Soliai is probably the least heralded player on the franchise tag list, given that he only emerged as a starter in 2010. But the Utah product emerged as a big-time nose tackle with veteran Jason Ferguson out this year, And since 3-4 nose tackles are incredibly hard to find, Soliai was going to be a hot commodity on the open market. Soliai holds the point of attack well against the run and can be disruptive at times, which is why the Dolphins are giving him a raise from his $467,000 2010 salary to the $12.4 million franchise tag in 2011. Soliai is expected to sign his tender to lock in the deal that’s worth 29 times more than what he made last year. 1 – PK Phil Dawson, Brown (non-exclusive franchise tag) – Dawson, who has been Cleveland’s kicker since the franchise returned in 1999, has been a reliable kicker throughout his Browns career. For a team without a lot of high-profile free agents, protecting rights to Dawson makes sense. The price tag (between $3 and $3.5 million) won’t be exorbinant, and Dawson does contribute to the bottom line. Dawson has been angling for a long-term deal, but a one-year guarantee at this price is a nice consolation prize given his position. 1 (con’t) – PK David Akers, Eagles (transitioned) – It took Akers a couple of years to establish himself in the pros, but once he did he has become an 11-year stalwart at kicker for them. He’s made five Pro Bowls, including the last two, and was an all-decade kicker for the 2000s. The Eagles clearly trust Akers, despite a couple of misses in the playoffs this year. For a contender, paying a few million dollars to keep a trusted kicker is a worthwhile investment, and it’s not uncommon for kickers to get tagged, because it’s not prohibitively expensive to do so, and this seems like a shrewd move for the Eagles. Akers, meanwhile, continues to kick at a high level, and he deserves to cash in. In a week full of on-field news, what’s happening off the field in New England is a fascinating warning flare. First, ESPN reported that a potential end to OG Logan Mankins’ contract stalemate with the team fell apart when the franchise demanded first a private and then a public apology from the Pro Bowl guard. Then, after the Patriots’ 38-24 Week One win over Cincinnati, WR Randy Moss ranted and rambled about not having a contract past 2010. So as we look at this double rainbow of dissent in Foxboro, we must ask the question – what does it mean? Bill Belichick has long made his living on being the first and the last word in New England. And that meant that Belichick made the calls about who got new contracts and who got shown the door. Tedy Bruschi got to stay; Lawyer Milloy had to go. Vince Wilfork got paid; Richard Seymour got shipped to Oakland. Belichick made ruthless evaluations about star players, and he was never afraid to say goodbye if he thought the price tag outweighed a player’s value going forward. That’s what’s happening with Moss. At age 33, his decline is coming. Receivers don’t maintain their speed into their mid-30s. And frankly, you can’t blame Belichick and the Pats for not wanting to give Moss a golden-parachute contract – at least when you look at the decision in a vaccuum. But Moss doesn’t live in a vaccuum. He lives in a diva receiva world in which you can pout your way out of most problems and quit your way out of the rest. Moss talked and acted his way out of Minnesota and out of Oakland, and you have to wonder whether he’ll do the same now in New England. The finishing manuever is in his arsenal, and he’s not afraid to use it. And that adds a degree of difficulty to Belichick’s cold, calculating decision. While you can give the Pats the benefit of the doubt in the Moss situation, at least before considering Moss’ history, what they reportedly did to Mankins was downright petty. 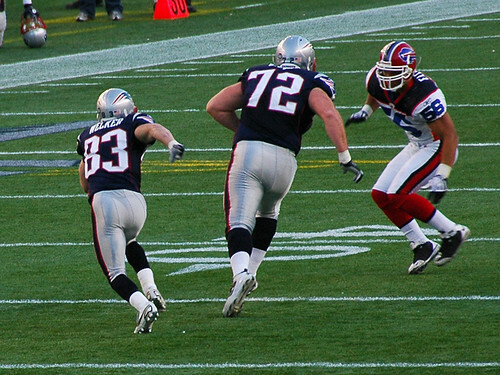 Mankins hasn’t just been holding out; he has publicly criticized the organziation. And because Belichick’s organization in sacred in New England, the Pats demanded that penace be paid before Mankins was. So in the last minutes of positive momentum toward a Mankins contract, the team told Mankins that he needed to apologize for questioning owner Robert Kraft’s integrity. Mankins did so in a conversation with Kraft. But 90 minutes later, the Patriots asked Mankins to make a public apology. Mankins not only refused but got offended at the additional demand, and he walked away from a deal that could have been worth $50 million plus on paper. And that’s where the Patriot games became counterproductive. By trying to ensure that the organization won not only the negotiation but the PR battle, the franchise actually pushed Mankins further away. There was nothing to gain in demanding a public apology from Mankins, and any face that an apology would have saved has been far outpaced by the downside of the public-apology demand becoming public. Before, you could call the Patriots cruelly effective in their free-agency decisions. But after the Mankins news, they now look more spitefully petty. That’s the kind of attitude that can lose the locker room if wins don’t pile up. Maybe the Patriots will win enough games to survive the fallout of their latest Patriot games. But if they don’t, Mankins won’t be making an apology for them. Neither will we.